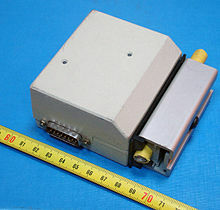 10BASE5 (also known as thick Ethernet or thicknet) was the first commercially available variant of Ethernet. 10BASE5 uses a thick and stiff coaxial cable up to 500 metres (1,600 ft) in length. Up to 100 stations can be connected to the cable using vampire taps and share a single collision domain with 10 Mbit/s of bandwidth shared among them. The system is difficult to install and maintain. 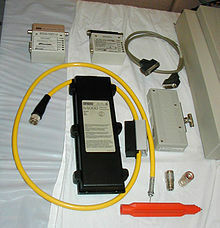 10BASE5 was superseded by much cheaper and more convenient alternatives: first by 10BASE2 based on a thinner coaxial cable, and then once Ethernet over twisted pair was developed, by 10BASE-T and its successors 100BASE-TX and 1000BASE-T. As of 2003, IEEE 802.3 has deprecated this standard for new installations. The name 10BASE5 is derived from several characteristics of the physical medium. The 10 refers to its transmission speed of 10 Mbit/s. The BASE is short for baseband signalling (as opposed to broadband), and the 5 stands for the maximum segment length of 500 meters (1,600 ft). For its physical layer 10BASE5 uses cable similar to RG-8/U coaxial cable but with extra braided shielding. This is a stiff, 0.375-inch (9.5 mm) diameter cable with an impedance of 50 ohms, a solid center conductor, a foam insulating filler, a shielding braid, and an outer jacket. The outer jacket is often yellow-to-orange fluorinated ethylene propylene (for fire resistance) so it often is called "yellow cable", "orange hose", or sometimes humorously "frozen yellow garden hose". 10BASE5 coaxial cables had a maximum length of 500 metres (1,600 ft). Up to 100 nodes could be connected to a 10BASE5 segment. Transceiver nodes can be connected to cable segments with N connectors, or via a vampire tap, which allows new nodes to be added while existing connections are live. A vampire tap clamps onto the cable, a hole is drilled through the outer shielding, and a spike is forced to pierce and contact the inner conductor while other spikes bite into the outer braided shield. Care is required to keep the outer shield from touching the spike; installation kits include a "coring tool" to drill through the outer layers and a "braid pick" to clear stray pieces of the outer shield. Transceivers should be installed only at precise 2.5-metre intervals. This distance was chosen to not correspond to the wavelength of the signal; this ensures that the reflections from multiple taps are not in phase. These suitable points are marked on the cable with black bands. The cable is required to be one continuous run; T-connections are not allowed. As is the case with most other high-speed buses, segments must be terminated at each end. For coaxial-cable-based Ethernet, each end of the cable has a 50 ohm resistor attached. Typically this resistor is built into a male N connector and attached to the end of the cable just past the last device. With termination missing, or if there is a break in the cable, the signal on the bus will be reflected, rather than dissipated when it reached the end. This reflected signal is indistinguishable from a collision, and prevents communication. Adding new stations to network is complicated by the need to accurately pierce the cable. The cable is stiff and difficult to bend around corners. One improper connection can take down the whole network and finding the source of the trouble is difficult. Wikimedia Commons has media related to 10BASE5. ^ Stallings, William (1993). Local and Metropolitan Area Networks. Macmillan Publishing Company. p. 107. ISBN 0-02-415465-2. ^ Mike Meyers (2004). All-in-One Networking+ Certification Exam Guide (3rd ed.). McGraw-Hill. p. 79. ^ "5-4-3 rule". Retrieved 2010-06-30. ^ sponsor Technical Committee on Computer Communications of the IEEE Computer Society. (1985). IEEE Standard 802.3-1985. IEEE. p. 121. ISBN 0-471-82749-5. ^ Urd Von Burg; Martin Kenny (December 2003). "Sponsors, Communities, and Standards: Ethernet vs. Token Ring in the Local Area Networking Business" (PDF). Archived from the original (PDF) on 2012-03-22. Retrieved 2012-03-25.